glad to have you on board, smakk.....love you signature as well. "true, defense wins championships but i never won a championship when we didn't score." HS we ran the I in JH we ran the wishbone only played hs football 1 year we always ran the 50 on defense. As long as you love football. Welcome. I have been mostly a defensive coach, although coached a lot of offence in the early days. I have been a head coach. We try to base out of the 52, but show a lot of 43 as well. I have coached every position of the defensive side of the ball and most positions on offense. I coached with SlipScreen for two years and have known tog for several years. I am 63 years young and am still very active. I get fired up just thinking about football. Don't know near as much as I wish I did, but continue to try to learn everyday. Don't be so modest Split. We know you've forgotten more football than we'll ever know. After all, you're the Godfather. Originally from the Houston area where my father was my HC in HS. I'm mainly an offense guy, but I like the "darkside" too. I've been a HC at two different schools (1A & 4A) and I've been a DC and OC at the 3A and 4A levels. I've coached OL 18 out of 19 years and will continue to coach it as a HC. After all, things don't work without the big boys up front. I firmly believe this is the area that is the most important (sorry Split!). I've also coached every position on defense, except the Secondary. Split.......by the way, it's good to have you in "civilization" now. I agree if you can’t run block or pass block you will be hard pressed to have any type of success. It has been my experience coaching at a jr. college one of the most under coached position at the HS level is the offensive line. I have coached primarily on the offensive side of the ball (RBs, QBs, WRs) and hope to get some work down on the O line either this year or next. My favorite offense is the split back veer and a close second is the tight double wing. I give the nod to the veer simply because you can employ pro sets and spread the defense horizontally with the passing game and have a potent running game to boot. But I do love to see the counter-Trey bust wide-open from the double wing... man, decisions, decisions!! Defensively I prefer a shaded 50 front employing a drop lineman vs 1-back sets. I like to teach technique and alignment vs stunts and slants. I also think building character and giving your players the opportunity to go to college is the single most important measure of a coach there can be. Of course, you gotta win some to keep doing that, but you know what I mean! Anyway, that's enough about me. Looking forward to reading a lot of great posts on this new site. "If you can't run it perfectly, you haven't practiced it enough." I love the Wing-T, I think there is so much you can do with it, you can be so multiple. The Fly Offense is awesome. It has Wing-T principles, but it a spread offense. The defense has to defend both flanks and the inside run, they also have to be disciplined, if not you'll be able to hurt them somewhere. You can go from either two backs or one back, you can still run your spread and gun stuff and the defense doesn't know whether your going to run the Fly sweep or not. Take my word for it, guys, Hawke knows defense. He is very good and is willing to share. Better pick his brain now, because he is probably getting so old he is getting senile. He doesn't remember everything he used to remember. Right, Hawke. Glad to have you with us, buddy. can you tell us your system in a new post for how you get so multiple in your looks yet keep it simple for the kids? is it similar to split's? I play high school for the Kilgore Bulldogs. Name is Scipio. Defensive Tackle for the Kilgore Bulldogs. Kilgore is located in East Texas, Piney Woods Region. We're in an area with two other state champions, Tyler Lee ( Div. 1 5A) and Gilmer (Div.2 3A) along with two other schools that were state finalists Marshall (Div. 1 4A) and Troup (Div.2 2A). 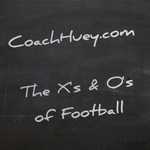 For the most part, I'm fascinated with football and thought about coaching either as an Offensive or Defensive Line. I'm either becoming an engineer, awyer or coach... Haven't decided on a college but I've narrowed it down to UT, Texas Tech or SFA. Play with your head, execute with your heart. My Junior year back in Houson, at Northbrook we ran a straight run and shoot offense and my senior year we ran "I"
i mainly played TE till my senior year when I was moved to center. I am always looking to find good reading material for football. Have been coaching for 16 years in Texas, first 5 at the Jr High level. Was mostly a Defensive guy until recently, coached the split (multiple 4-4), Miami or College 4-3, True 5-2 and also the 3-4...LB's (inside and out) and Secondary (my true love on defense). Recently made the switch to Offense and am the OC in a multiple tackle over I and spread gun offense. Hve coached QB's, RB's and helped with the OL (not my strongest, but I'm learning). Have been around I, Spread, and Wishbone offenses, but have seen a little of everything gameplanning as a defensive guy. Like to read more on football than type on it, and have been known to be a bit of a smart azz on some boards (won't do it here, I promise). Looking forward to learning from you guys. I'm in Virginia, have coached for 25 years, and have been on coaching message boards pretty much for as long as there have been message boards. I'm a DC and work with DBs and OL. We run an 8 man front (4-2 and some 3-3) but we have run 43 and shade 50. Offensively we run an I but we have run bone and I-bone. Although I've been here since 1977 I'm a Pennsylvania native and have known Hawke for quite a while. Ask him about Black Monday some time. Coaching-Have been in wishbone, I, and split back veer. Now coaching D-Line at a 5a school and calling the soph. D for last 3 years. I coached OL at college level for one year prior to now. I played OT for four years there. Everyone may recieve more questions than answers from me, but I'll give ya what can. Hello. I am a new coach at a HS in the midwest. I will be coaching offense and defense for the 9th grade team. We run the I and a 4-3 on defense. Great Job with the board TOG. High School- Mulitple I on offense, 4-4 base on defense with a myriad of fronts mixed in. I am a HC at a small school in the midwest. Currently running mulitiple formation offense. Running game- midline, iv, ov, gt counter, iso, passing- basic routes from mulitple sets. Defense- have been 4-4 but looking at 4-3,3-4,or 5-2 invert, any one have any information? TOG we have spoken before over email, and once again thanks. Keep up the good work. just to clarify, this is Huey's board. I am the PR department. I am a Florida guy, born and raised in Tampa. I am not officially a coach, but work with coaches all around the state of Florida. I have coached in the past and have a great passion for the game and the kids. I look forward to some great football discussion with you guys.